A commemorative songbook containing the landmark, sixteen song reunion set of the hard rock legends. On December 10, 2007, Led Zeppelin reunited to headline the Ahmet Ertegun Tribute Concert at the O2 Arena, London. 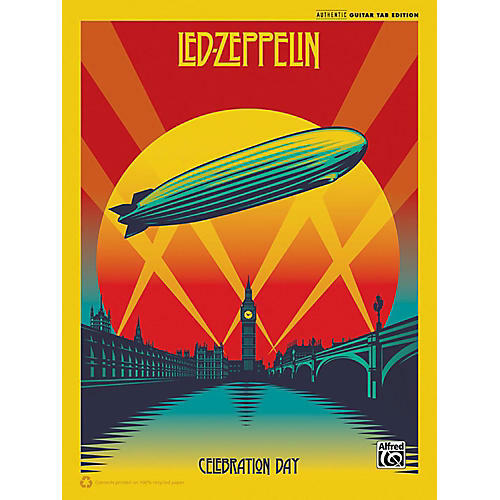 The exclusive Led Zeppelin: Celebration Day songbook presents authentic guitar TAB transcriptions of the 16 classic songs that made up the set, based on the original studio recordings. Titles: Good Times Bad Times * Ramble On * Black Dog * In My Time of Dying * For Your Life * Trampled Under Foot * Nobody's Fault but Mine * No Quarter * Since I've Been Loving You * Dazed and Confused * Stairway to Heaven * The Song Remains the Same * Misty Mountain Hop * Kashmir * Whole Lotta Love * Rock and Roll.